ANAHEIM, California -- Expanding product categories, DigiTech today announced the introduction of its guitar and bass amplifiers at NAMM 2011. Combining renowned DigiTech sound quality and tonal flexibility with outstanding value, the new DigiTech amplifier lineup includes five combo guitar amps, a combo bass amp and a 150-Watt tube head with 4 x 12 cabinet half-stack. "In creating our DigiTech amplifiers, we knew we had to offer something more than a 'me too' product line in a market already filled with amps," stated, Rob Urry, President, Harman Music Group. "DigiTech has the unique advantage of decades of experience in creating many of the world's most recognizable sounds, effects pedals and products, and we put all of that expertise into designing a full line of amplifiers that provide an exceptional range of tones." The matching 4 x 12 cabinet features four 12-inch specially voiced Selenium® speakers to deliver maximum projection and punch with 400-watts power handling capability. The all-wood reinforced cabinet has a metal check mesh speaker grill, metal corners, recessed handles and removable casters. The DigiTech Fusion 150XD Stereo, Fusion 75XD and Fusion 30XD combo amplifiers incorporate the company's industry-standard modeling technology and effects including overdrive, distortion, reverb, delay, chorus and other mod-effects, Ideal for any musical style, the Fusion 150XD Stereo and 75XD offer 24 amp models, 37 total effects, a built-in 30-second looper and 20 presets (100 with optional Control 2 foot controller), while the Fusion 30XD includes 12 amp models, 12 effects and five presets (100 with optional Control 2 foot controller). All Fusion models feature a built-in chromatic tuner, an MP3/Aux input and a 1/4-inch headphones jack. The 75XD and 150XD also add a USB port that lets users connect to a computer and edit the amp's presets. DigiTech's 15GR, 15G and 15B combo amps offer an outstanding combination of light weight, easy portability and superb sound, from rich clean tones to roaring distortion and everything in between. The 15GR and 15G include Gain, Volume, Treble, Middle and Bass controls and a Clean/Overdrive switch, and the Classic-15B bass amp offers Volume, Treble, Middle and Bass, making it easy for players to create their favorite sounds. The Clssic-15GR also features a Spring Reverb that adds lush, ambient reverb. All Classic models also feature a 1/4" stereo headphones output for private listening. 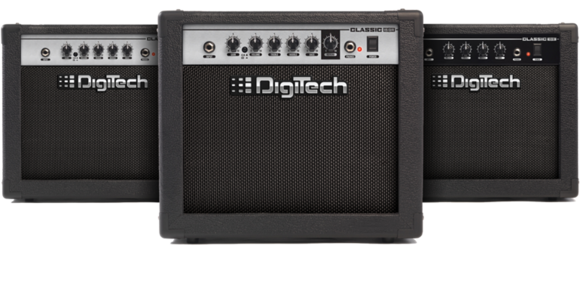 The DigiTech guitar and bass amplifiers will begin rolling out in Spring 2011.